FlashOpal values all our customers and we understand that sometimes budgets just don't quite reach the price on the item you must have. With this in mind, FlashOpal is accepting offers on any item. That's right! Any ring, pendant, earrings or opal stones for sale or any Made to Order jewelry, you can make an offer. Simply contact us through the product page and let us know what your offer is. 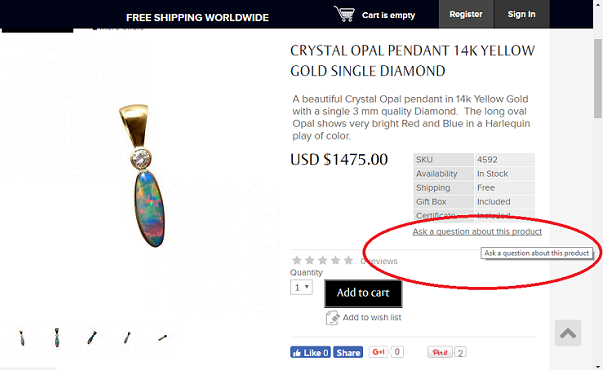 The image below shows where the link is to "Ask a question about this product". Please keep in mind that prices on all our opal jewelry, gemstone jewelry and loose stones are at manufacturers price - not the RRP found elsewhere - which is why we do not offer big discounts (30%, 50% or more) like many stores. Your offer may or may not be accepted or it may be counter offered but at no time are you obliged to purchase. If we agree with your price, you will be given a special coupon code for that particular item. Simply use your coupon code during checkout and you will pay the price agreed on. Easy! If you have any questions, need any assistance with choosing for a gift or have any comments, don't hesitate to contact us by email, live chat or phone. Please note, offers are not available on custom design jewelry or lay away.